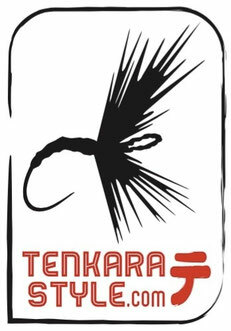 We are proud to offer Tenkara packs made the American company Zimmerbuilt which is one of the rare to produce packs designed by tenkara anglers for tenkara anglers. Zimmerbuilt tenkara packs are functional and strong and really answer the needs of tenkara anglers. The quality of these products will satisfy even the most demanding of you. The Tenkara Chest Pack is designed to create the ultimate tenkara fishing system when used in conjunction with the Tenkara Guide Sling. The pack has a 3 point connection system that easily connects to the Tenkara Guide Sling. The connection system is completely adjustable to allow for a perfect fit. A 3/4" buckle on the lower left of the pack allows the pack to be easily removed when using with the Tenkara Guide Sling. The Chest Pack can also be used alone with the supplied webbing, for those days when you do not need to carry a lot of gear. The pack measures 8.5" x 5.5" x 2" and weighs 3 oz. The pack features #3 and #5 water resistant zippers. The Tenkara Strap Pack is designed to attach to the shoulder strap of the Tenkara Guide Sling or any other pack with shoulder strap webbing via two slick clips. The pack measures 6"x4.5"x2" and weighs 1.5 oz. The pack allows for easy access and is large enough to fit a small fly box, tenkara line, tippet and tools. Two upper loops allow for easy connection of the supplied cord so the Tenkara strap pack can also be carried around your neck.